The sun’s out, it’s summer in Cologne and I feel the urgent need to not be in an enclosed space right now. 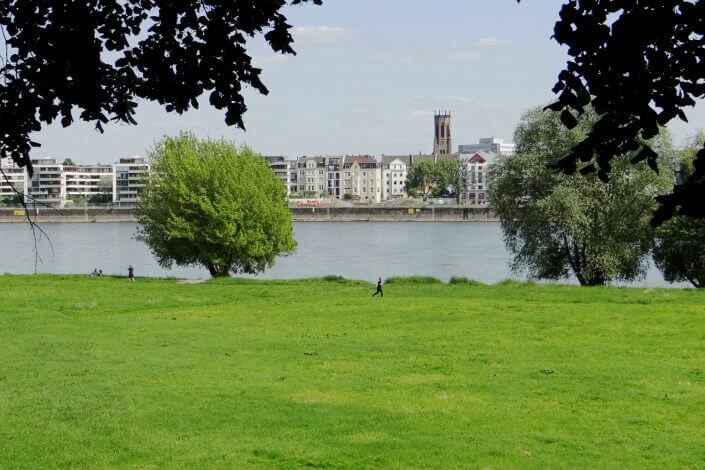 Alas, work prevents me from taking a holiday so I compromise, throw my pop-up tent and some other camping paraphernalia in the car boot and head south: specifically, to the south of Cologne where, in the leafy suburb of Rodenkirchen, there’s a campsite right on the banks of the Rhine. 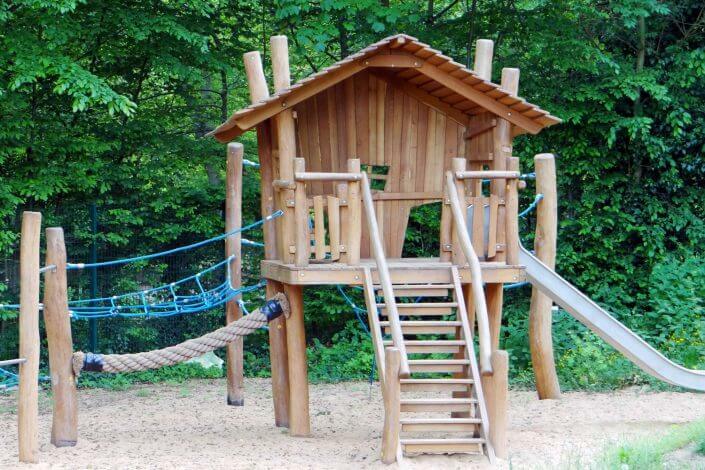 A trip to the great outdoors a stone’s throw from the city centre – sounds like the perfect getaway, right? Well, what are you waiting for? I’ve checked out the three campsites in Cologne, plus one that’s reserved for RVs, all near a body of water and reachable by public transport. Camping Berger is Cologne’s largest campsite, almost a small village really. 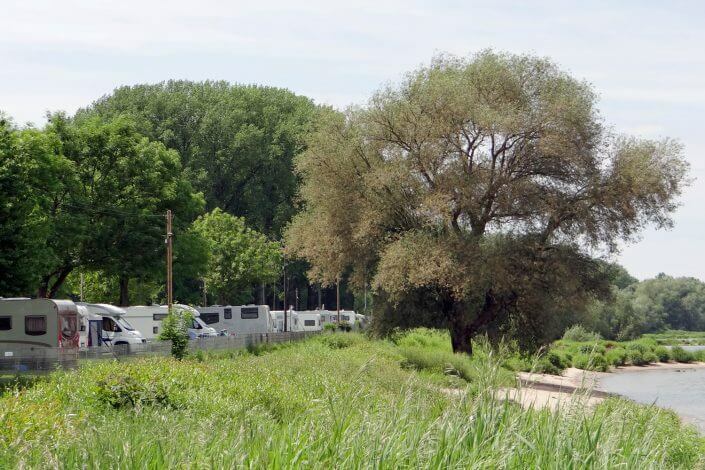 The wind swishes through the trees, the passing cargo ships sound their horns, and campers are only divided from the banks of the Rhine and its pretty beach bays by a cycle and pedestrian path. 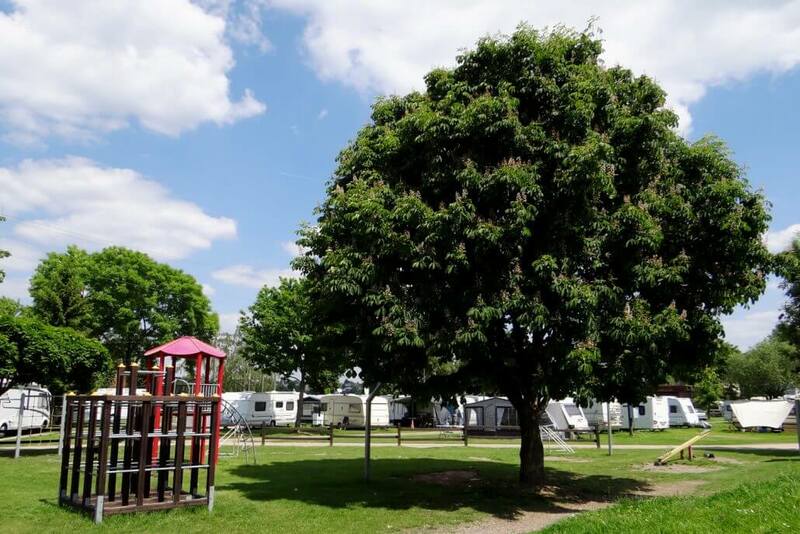 There’s around 150 tree-shaded spots for short-term campers and another 150 for permanent guests, whose residences are adorned with potted plants, bird feeders and garden furniture. There’s a playground for kids plus a very handy mini-market on site selling groceries, sun lotion, magazines – and coffee. 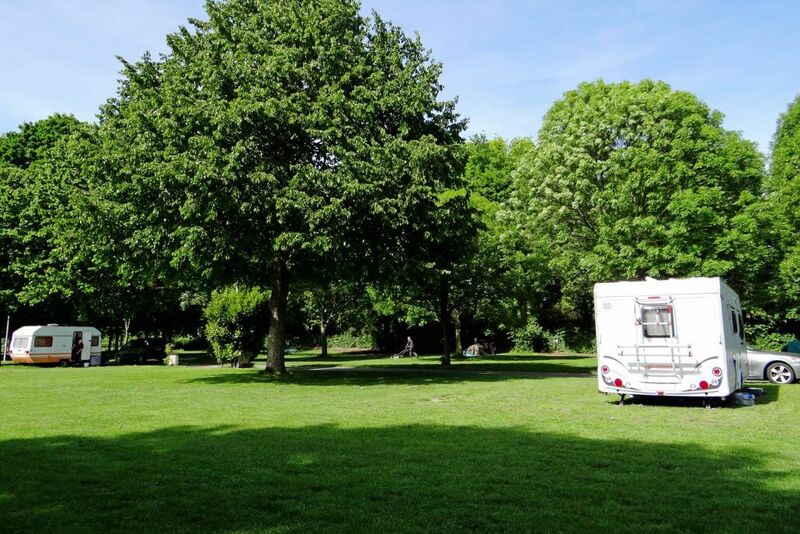 The communal bathroom and cooking facilities are generously proportioned and well maintained. It’s all very state-of-the-art here, although Berger is one of the oldest campsites in Germany. 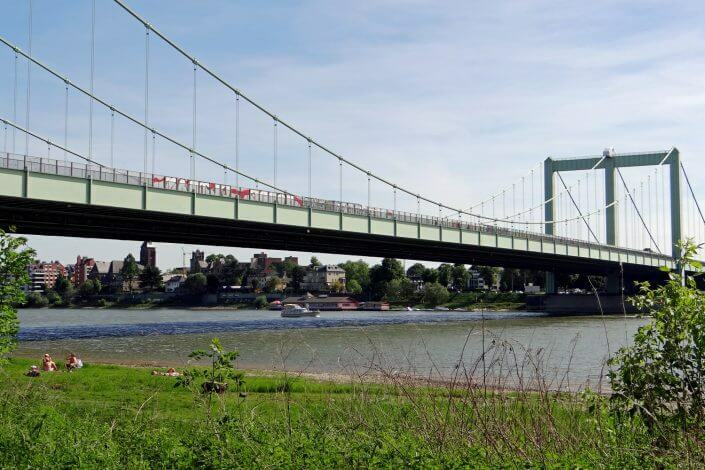 Downriver, on the east bank in Poll, is a slightly smaller campsite by the name of Stadt Köln. The journey there is already a pleasure in itself ¬¬– the path winds its way through the lush green meadows and offers great view of the Cathedral and the “crane houses” on the other side of the river. Proprietor Astrid Eckardt gives me a warm welcome. 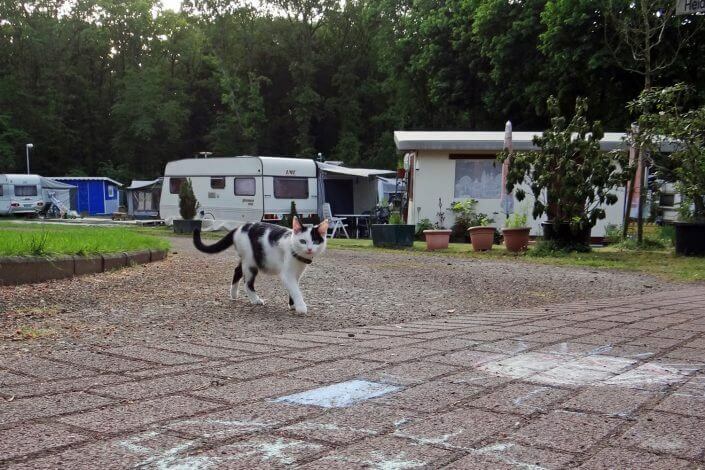 It’s a quiet period, and because the campsite isn’t one of the largest, there’s barely any permanent residents. Also, I am told, a group of Scandinavian ice hockey fans who were here for the world championships have just departed. 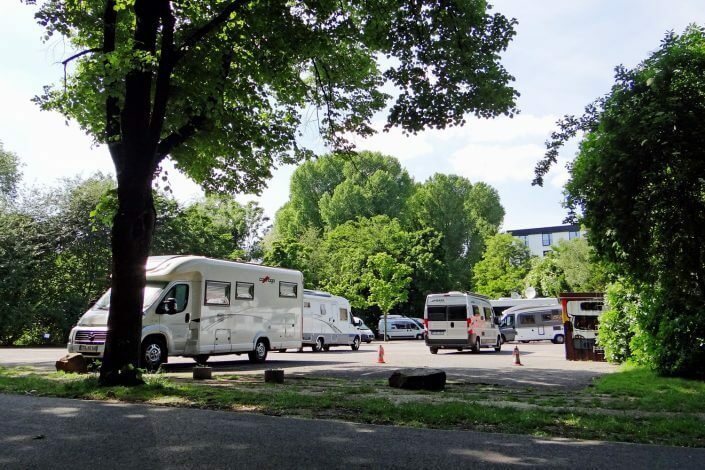 As with all of Cologne’s campsites, the spots fill up very quickly during major events such as gamescom, Kölner Lichter or Christopher Street Day. 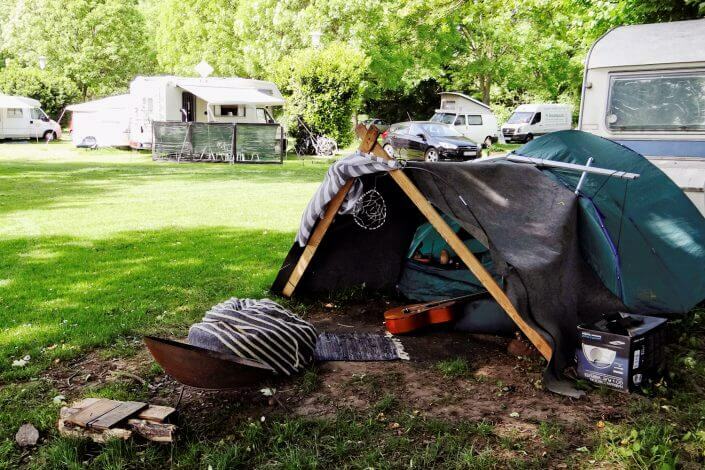 The campers come from all over the place; some are drop-ins, like the cyclists who stop off here on their way up or down the river. 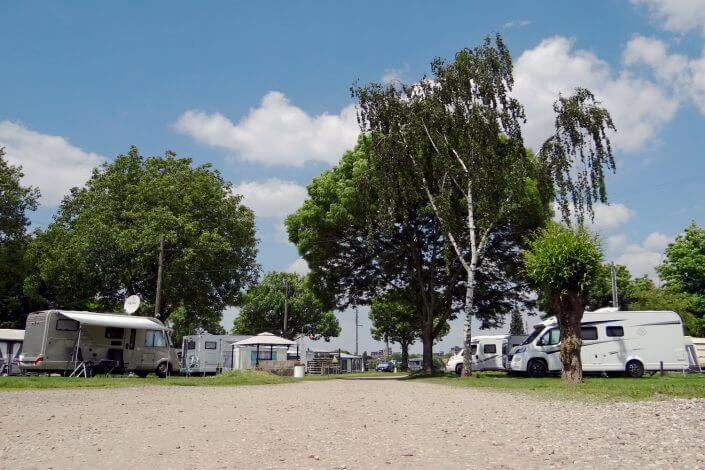 The site is dotted with large trees and the motorway isn’t far away, although the noise is manageable. 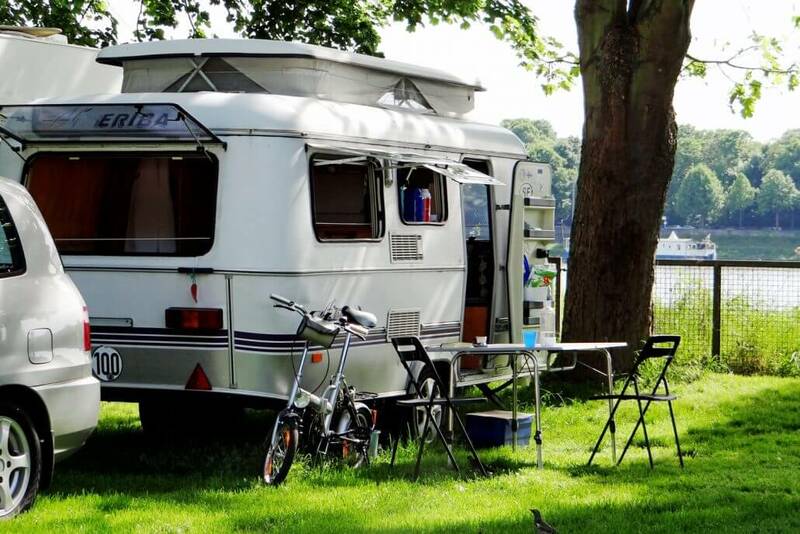 The campsite is removed from the riverside only by a cycle path, with plenty of lounging space on the grassy banks on the water. 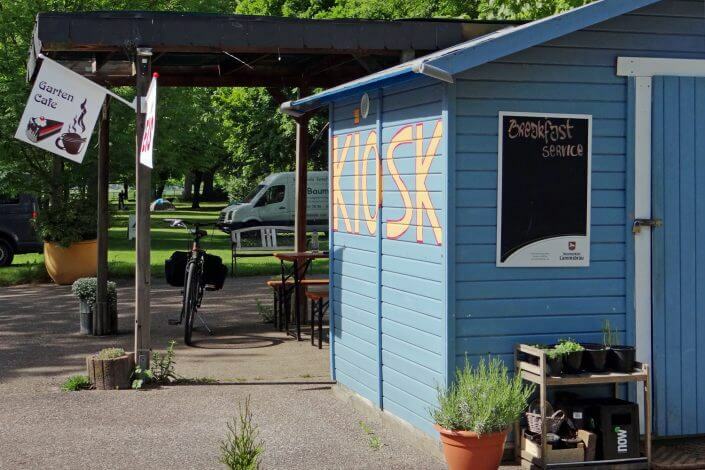 There’s a kiosk on site selling fresh rolls or a full breakfast in the morning, plus coffee and cake in the afternoon – excellent! Just a stone’s throw away is a restaurant plus beer garden. 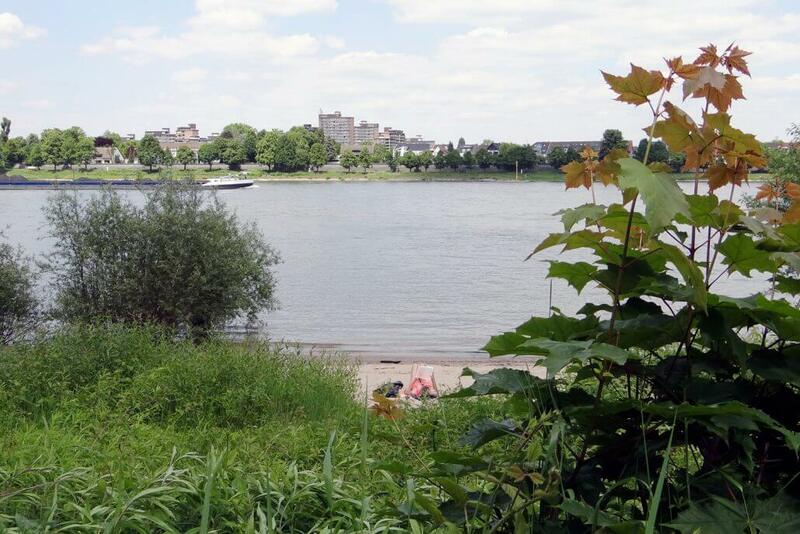 A few hundred yards in the other direction is Poller Strandbar, a superb beach club that I’ve previously written about (→ Cologne’s off to the beach). 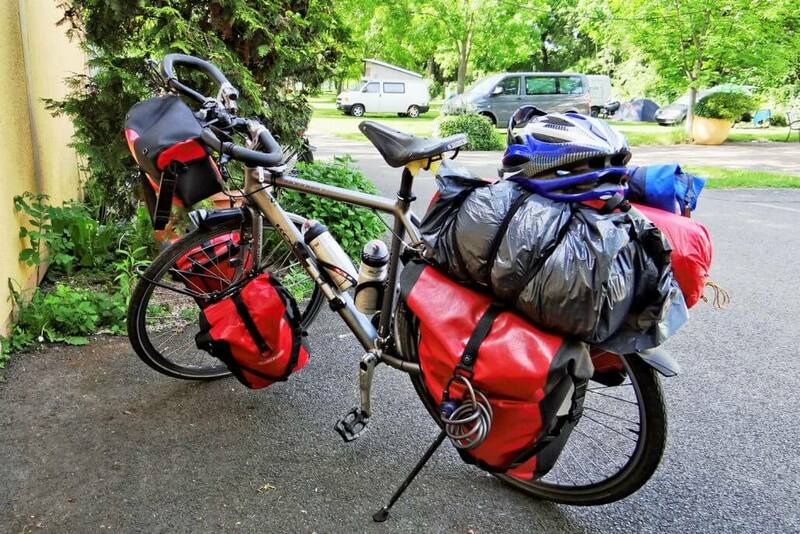 Just grab one of the campsite’s rental bikes and you’re there in a jiffy. 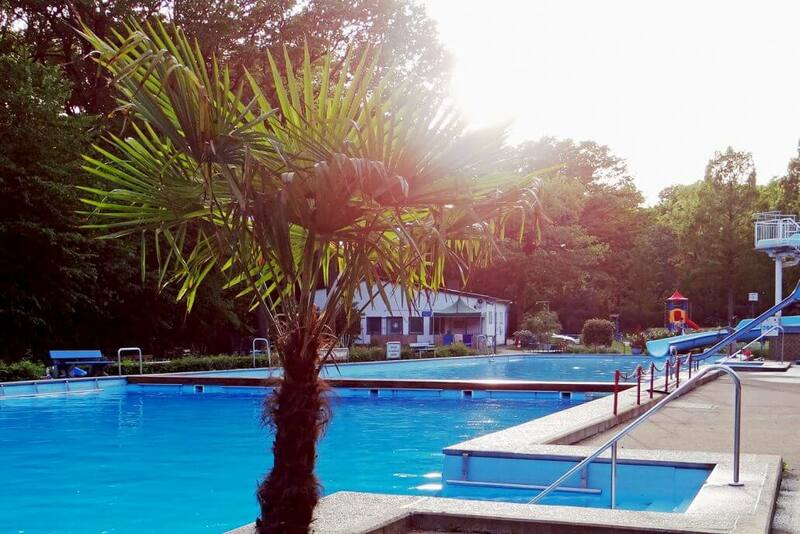 Waldbad in Cologne-Dünnwald is the only campsite that’s not on the river – instead, it’s in the forest and has one major asset: a large open air pool with swimming lanes, a water slide, grassy lounging areas and a beach volleyball court. Plus there’s crazy golf and a wildlife park just next door. 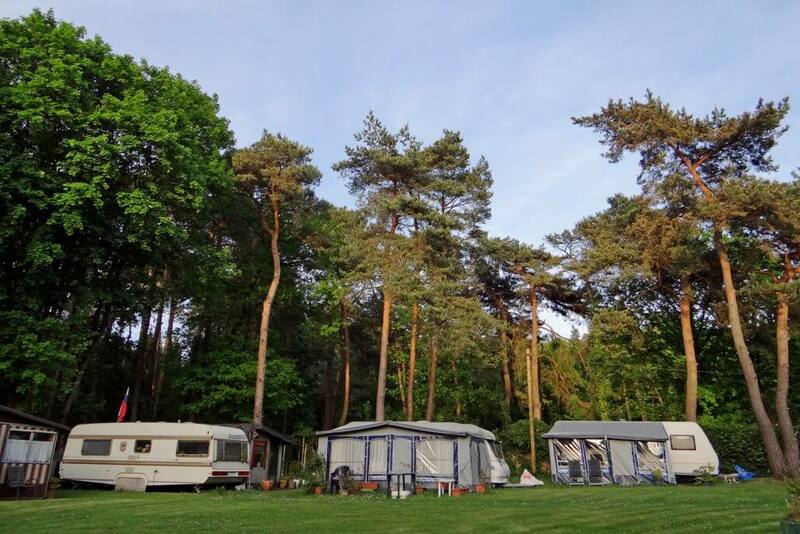 This small campsite is surrounded by tall pine and fir trees, with birds going mad in the treetops. Mobile phone reception is patchy. 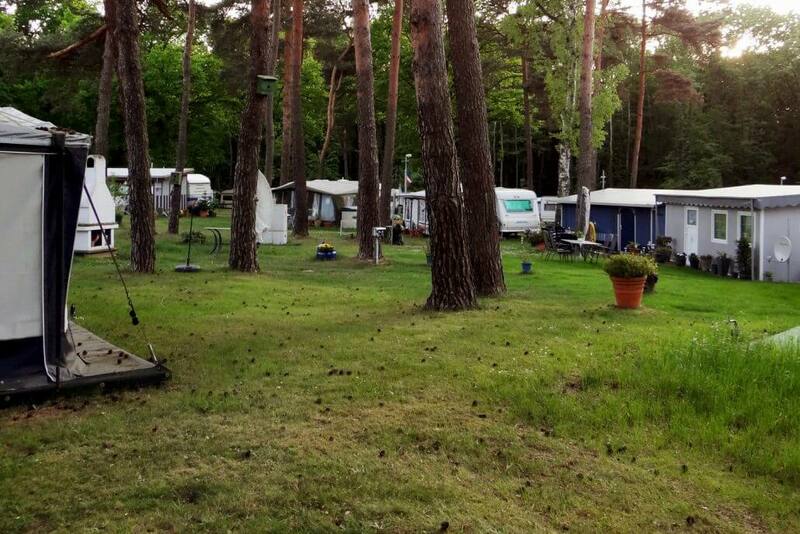 Around 50 permanent campers are on site at any one time, with some 20 pitches reserved for temporary guests. 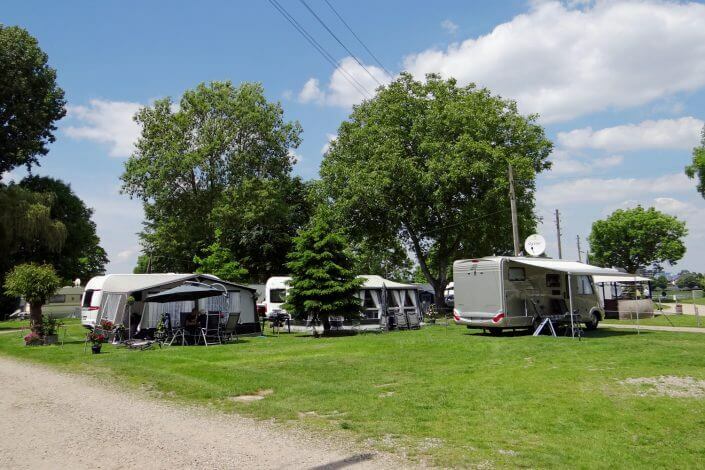 If you decide to drop in without the required equipment, there’s also two guest bedrooms and a caravan plus awing. There’s a common room with a book shelf and TV and a kitchen and fridge for residents’ use next door. No breakfast is served, but you can pre-order fresh bread rolls. 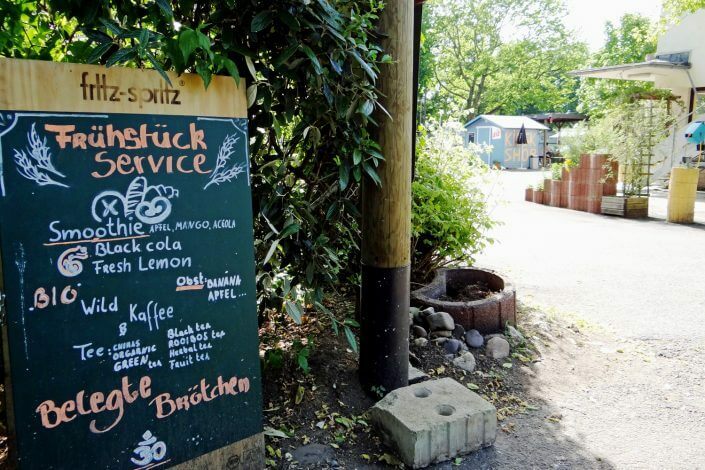 A restaurant located between the campsite and the pool serves cooked meals. By the way, the swimming pool is also a venue for concerts, midnight swimming events and aquagym sessions. 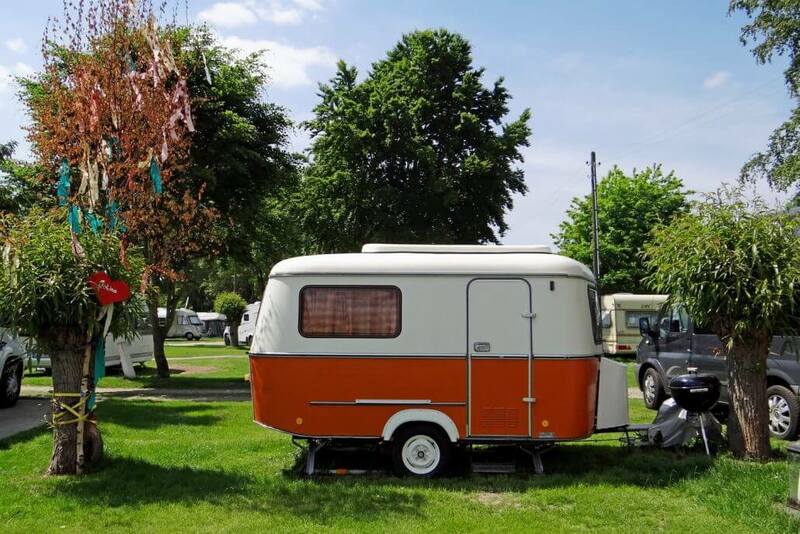 The RV site in Riehl is located on the grounds of the National Garten Show of 1971, right in the middle of the Riehler Aue meadows. There’s over 60 tarmacked RV spots here, surrounded by extensive lawns. 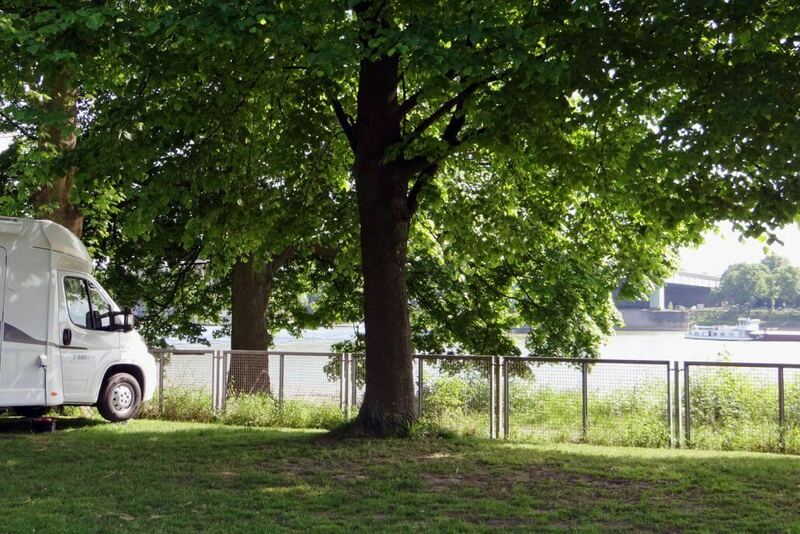 The spots in the front row come with a river view. There’s no toilet or shower blocks on site, but residents are welcome to use the facilities at the state-of-the-art youth hostel just next door. 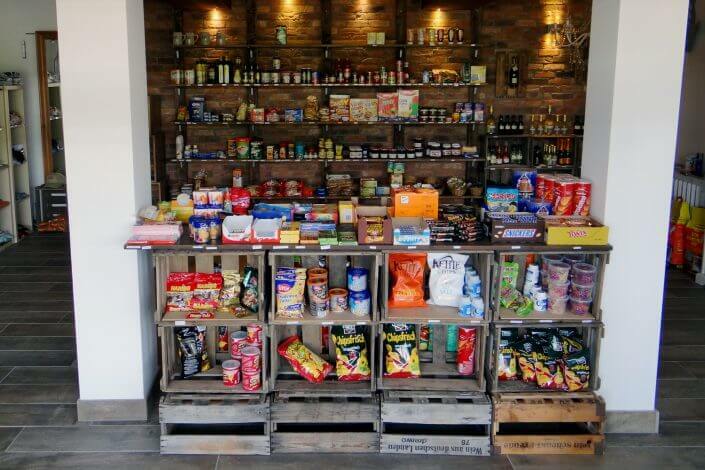 The canteen offers delicious food as well as a sunny patio, an on-site bar and a small kiosk. Cologne Zoo and the cable car across the Rhine are not far. The city centre is easily accessible, with a public transport connection a few minutes’ walk away.